Sometimes you just want to hole up in a dive bar, and it doesn't get much divier than this. Many a Louisvillian has never stepped foot inside Freddie's, but those that do form a peculiar allegiance to this half-century-old downtown institution. Think dim, cash-only, and festooned with boxing memorabilia. Also think stiff—and better still, cheap—drinks doled out by a grizzled bartender, bags of potato chips the only sustenance in sight, and a choose-your-own-adventure jukebox. 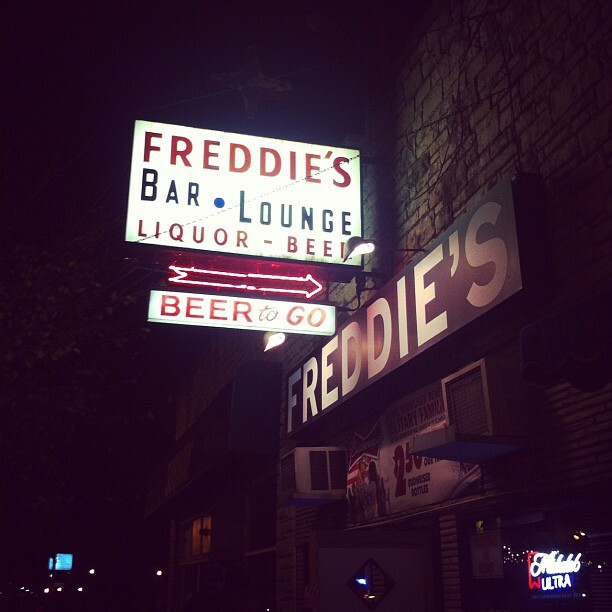 I like Freddie's Bar & Lounge for dates. I think you can tell a lot about a man by how they react to Freddie's. It's cash only. It's dark. You get in trouble if you play dirty music on the jukebox (it happened to me!). And as much as I like a good martini or brunch at the Seelbach bar, I also can hang in a dive.